that uses, includes, or depicts metal in some way. 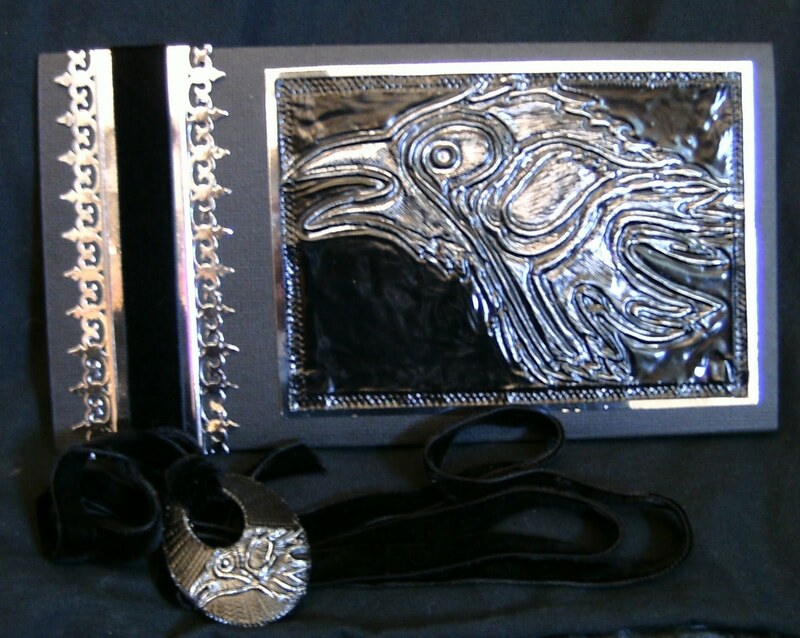 You can go very literal with metal embellishments or metallic papers.Or you can use the Metal music genre for your muse, or maybe some industrial H.R. Giger type stuff.Make it dark if you dare! !We like things a bit more on the spooky side here in 'da house! 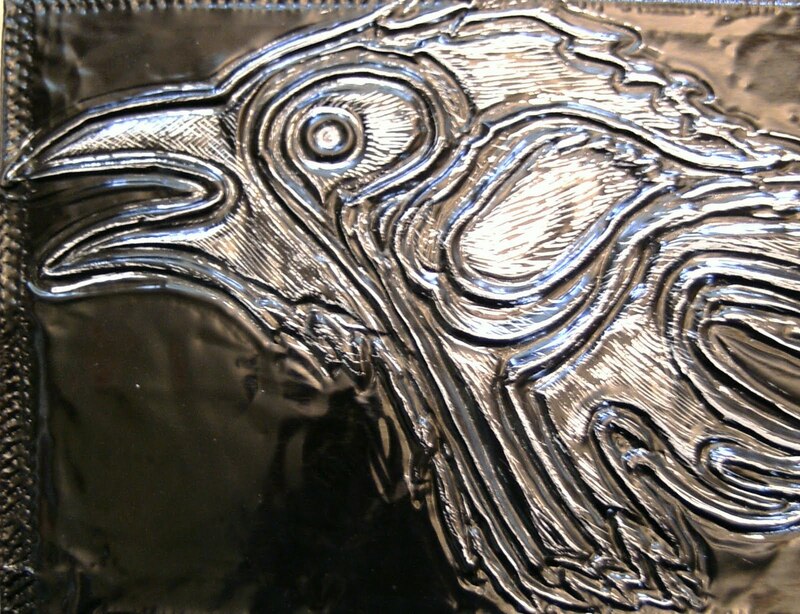 http://www.ikesart.com/#!__digital-art-stamps/productsstackergalleryv20=7 and traced really well on to some black coated metal. 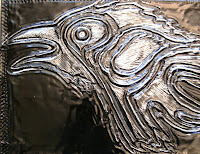 I embossed the image into the metal, then etched the details in. I matted it onto silver card then onto a black card base. 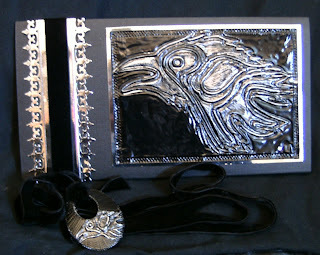 I used a MS punch on both edges of a strip of silver mirri card and added a piece of black velvet ribbon. 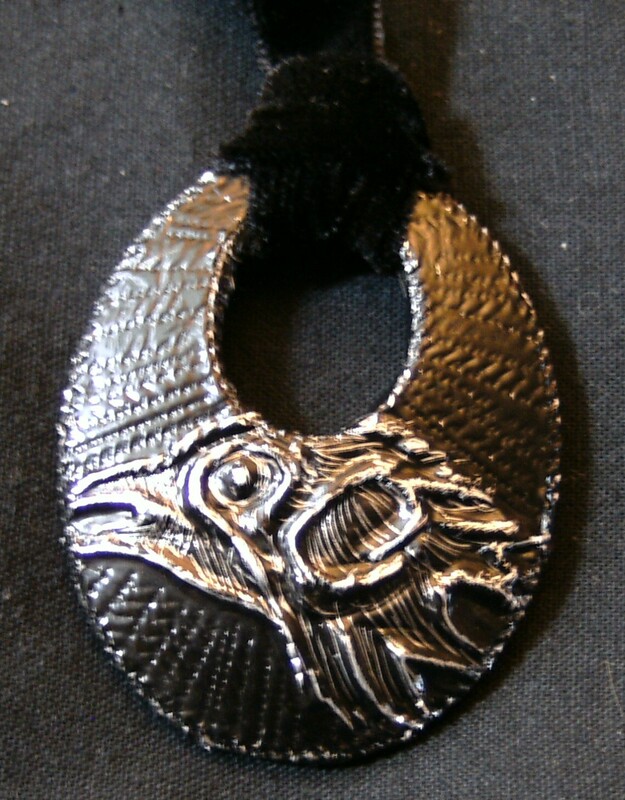 i did exactly the same as i did for the larger image on the card.... once finished i adhered it to a pendant blank, took my time making sure all the edges were neatly folded then with metal working tools made a pattern around the edge and onto the front around the RAVEN image. I have just threaded through some double sided jewelry quality velvet..... hopefully making it into a very wearable Gothic inspired necklace. I hope you'll have time this week to play along with us minions. http://frosteddesigns.blogspot.com/ CARD STOCK ONLY, NO PATTERNED PAPERS. Stunning ! Always a pleasure to see your amazing work lots of fantastic techniques on here and the detail is just amazing both the card and pendant are glorious. Oh wow, this is amazing!! You do absolutely beautiful work!! Thanks so much for playing along with us at Frosted Designs!! Wow...this is AMAZING! Thank you so much for linking up at MIM! Don't forget to leave a comment for another entry and mention you saw them on MIM; the more comments left, the greater your chance of winning! Oh my these are just stunning. I love the texture you've created on the ravens they look amazing. I like the elegant simplicity of the card layout, I think that the embossed image makes such a dramatic statement. Wow, that's cool, the bird looks fantastic. So original!! I love the metal work, this makes a stunning card. Thank you for entering into our challenge at Crafty Cardmakers - good luck! OH MY WOW!! Love the embossing and etching! This looks like you spent hours creating it!!!! OH.....MY.....GOODNESS...... I am totally speechless...... This is just truly outstanding.. what awesome pieces :-D I had NO idea you were into metal work too... a woman of many, many talents. The card is stunning and the necklace is divine. You make too light of yourself - both these pieces are genius and I would scratch someone's eyes out to get these in a sale. !!!!!!! BD...you make me feel so inferior. I bow once again to your crafting genius, my friend. I wish I had an ounce of your talent! 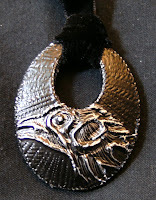 Your card is amazing and your pendant is completely over the top fabulous! I need lessons. 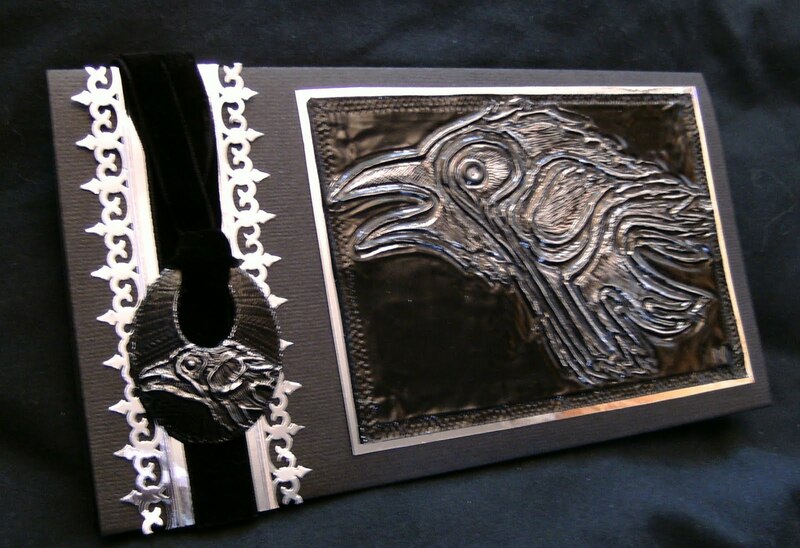 Lovin your metalwork... on a card???? lol. Your pendant is pretty spectacular and you've given me a great idea for some belt buckles I have which are almost the same shape! Fabulous card and necklace. I love what you did with both of them. Beautiful!!! you are sooo very talented.......yes I'm very envious. wow that is a fabulous creation! Thanks for joining us at Crafty Cardmakers this time and hope to see you again soon.